Zambia : Malawi criminalizes handouts for votes: What lessons do we learn from this? Home Politics Malawi criminalizes handouts for votes: What lessons do we learn from this? Malawi criminalizes handouts for votes: What lessons do we learn from this? Malawi has become one of the few countries in Africa to pass the Political Parties Act. The law, which came into effect on December 1, 2018, among other crimes bans politicians from using cash payments and other incentives to get support. However, the ban does not affect campaign materials such as posters, leaflets and clothing, according to AP. It has been enacted ahead of elections the country will hold in 2019. Malawi is set to hold presidential, parliamentary and council elections on May 21, and it is hoped that the law will level the playing field for politicians. Anyone found in contravention of the law will be required to pay up to 10m Kwacha ($835,980.60) or spend five years in jail. The law has been in discussion since 2017. Lawmakers have been debating on whether to enforce a partial or full ban. One faction had proposed banning political handouts during the election period but others wanted a complete ban, whether there are elections or not. With the exclusion of clothing and non-election period, will this law really level the playing field considering the high level of poverty in the country? Will it really achieve the intended objectives? Will it really level the playing field for politicians participating in an election? And what lessons do we draw from this law as Zambia? As the Green Party, we think that this law will not achieve intended objectives because of high levels of the poverty in the country. Chitenge materials, shirts, and all other various other types of clothing make a huge difference on voters who lack such needs. A party in government will for sure marshal resources from prospective government contractors to ‘dress’ the nation before and during election period and consequently win elections. 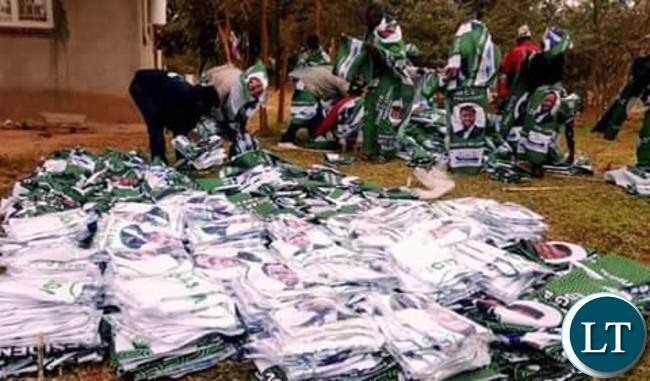 As Zambia, when time comes to enact the Political Parties Bill, we need to totally ban clothing before and during elections because of high level of poverty in the nation. Our view is that campaign materials should only be restricted to distribution of posters, leaflets and bill boards. We don’t anything at all. A similar law exists in Zambia but very hard to prove as can be seen from numerous petition results. To make it worse the law has been abused and rendered a joke by our very own Trib.al Hacks and his trib.al followers also known as upnd leaders. No Lessons. Malawians are still uNder Kamuzu Banda’s spell. He is educated, thinks out of the box, never resorts to name calling, always writes objectively. Why cannot he be commoners candidate for presidency? Why HH, Lungu, Kalaba, Kambwilli, Chipemo, Nawakwi? Chazya for Presidency in 2021. Common Sammy! insert it somewhere, HH seems insufficient, may just be the missing piece on the route to plot 1..
HH does have another name, it’s an English name. Because you don’t know he does means you don’t know $hit. We don’t learn anything at all. A similar law exists in Zambia but very hard to prove as can be seen from numerous petition results. To make it worse the law has been abused and rendered a joke by our very own Trib.al Hacks and his trib.al followers also known as upnd leaders. Even me I have 3 names Chilankalipa Nkafipanta Fingwele CNF Kikikikikikiki. Enacting laws in a lawless nation is a sheer waste of time and resources. Who will obey those laws if the *****s are not obeying the ones already in existence? Why are you blocking my Idi(amin)ots naimwe Ba LT? The only party regalia that should be allowed must be caps. The is comprehensively covered under the electoral malpractices except the Judiciary and ECZ whose hands are always tied. Each time we have elections we see politically motivated projects tailored to hoodwink voters such as giving out cash, food rations, donations, empowerment funds, Village televisions, renovations of roads, boreholes etc. The ruling party has institutionalized this illegal strategy and it has become a new normal. In 2021, this will be at massive scale especially that the PF have no narrative that resonates with the populace.